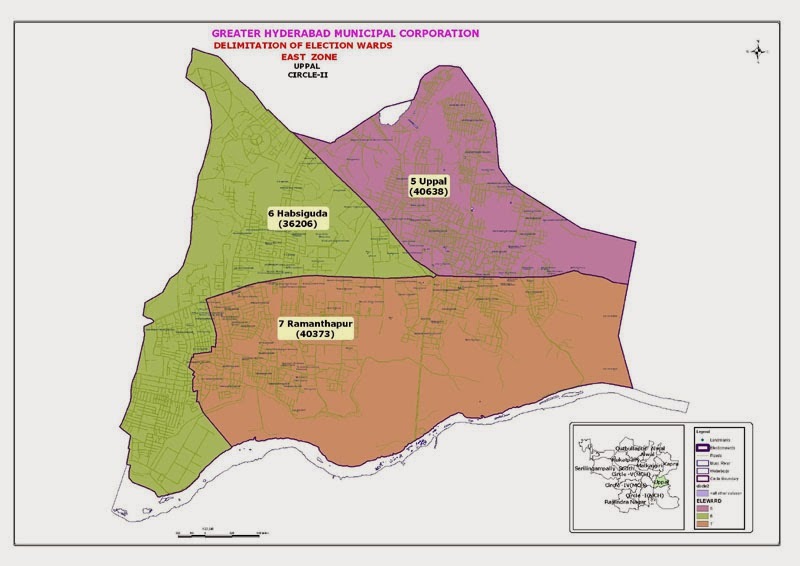 Greater Hyderabad Municipal Corporation or GHMC for short was formed from the erstwhile Municipal Corporation of Hyderabad. Several Municipalities and Panchayats from Ranga Reddy,Nalgonda and Medak district were also merged and are now part of GHMC. 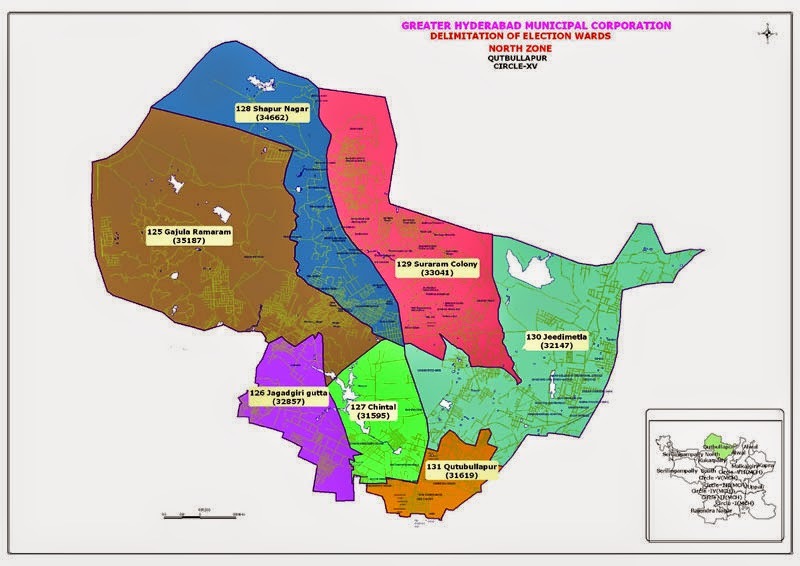 GHMC has divisions on the basis of Zones, Circles and Wards. 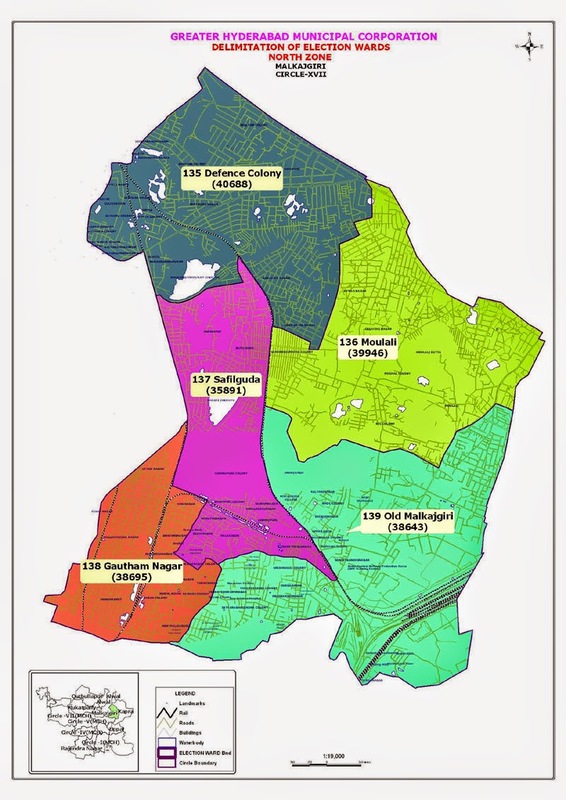 There are 5 zones, 18 Circles and 150 Wards under GHMC. You can find complete information about all the 3 levels of division in this article. There are 18 Circles within these 5 zones whose names are given below. South Zone has 3 Circles which are Circles 4,5 and 6. Circle 4: This circle is erstwhile Circle 1 in MCH. It has 25 wards under it. Some of them are Kanchanbagh, Saidabad, Santhoshnagar, Old Malakapet, Barkas, Uppuguda to name a few. Deputy Commissioner Circle No. 1, Sardarmahal, Charminar, Hyderabad - 500002. You can see complete list of areas in the Circle 4 Map below. Circle 5: Erstwhile Circle 2 under MCH is Circle 5 in GHMC. It has 14 wards under it and some of them are Begumbazar, Goshamahal, Puranapul, Falaknuma and Shalibanda. Deputy Commissioner Circle No. 2, Sardarmahal, Charminar, Hyderabad - 500002. 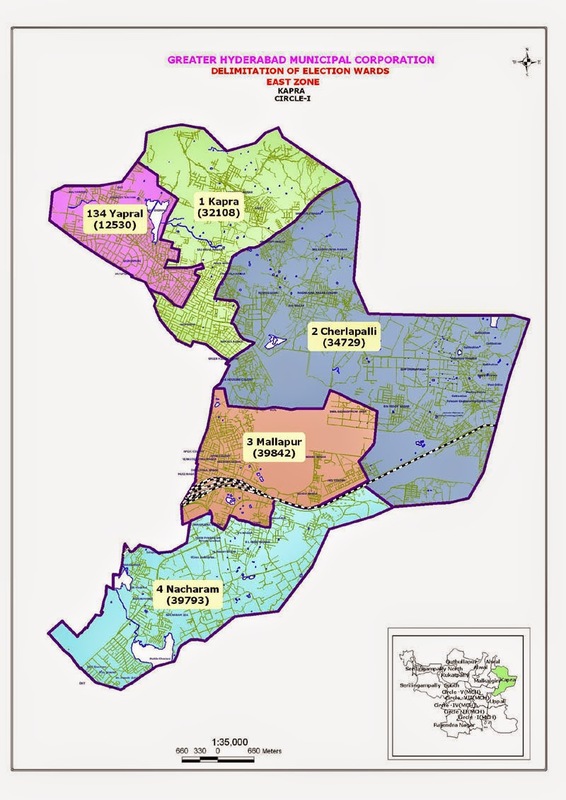 You can see GHMC Circle 5 Map below. Circle 6: Rajendranagar is Circle 6 under GHMC. It has 4 wards under which are Rajendranagar, Attapur, Shivrampally and Mylardevpally. Deputy Commissioner Office, Executive Officer, Near BSNL office Rajendra Nagar, Hyderabad- 500032. 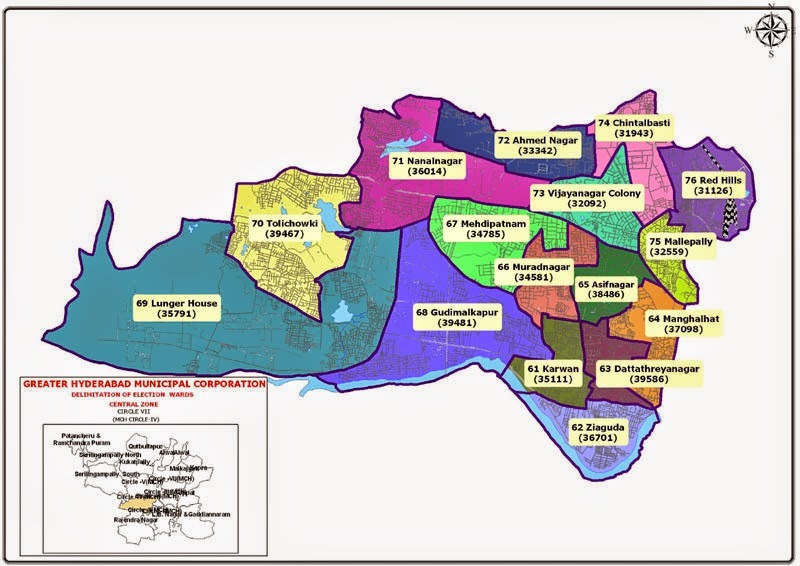 North Zone of GHMC has 4 Circles under it which are Circle 15,16,17 and 18. Circle 15: Qutbullapur is circle 15 and it has 7 wards under it. 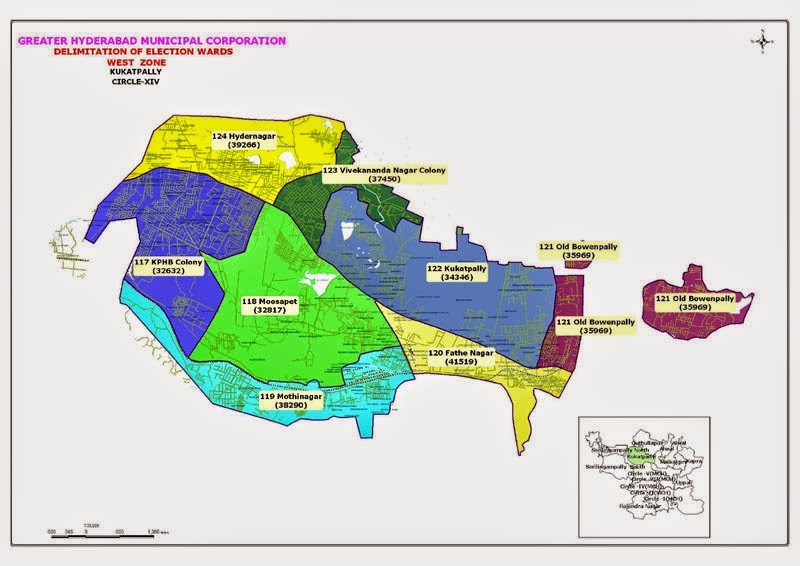 The wards under it are Shapur Nagar, Suraram Colony, Jeedimeetla, Gajula Ramaram, Jagadgiri gutta, Chintal and Qutbullapur. Deputy Commissioner, HMT Rd Chinthal, Municipal Office, Hyderabad 500055. You can see the Map of Circle 15 below. Alwal is Circle 16 in the North Zone. It has 3 wards under it which are Yapral, Macha Bollaram and Alwal. Deputy Commissioner Alwal Muncipality, Muncipality Alwal, Near Balaji Temple, Secunderabad - 500010. You can see Circle 16 Map below. Circle 17: Malkajgiri is Circle 17 and it has 5 wards under it. 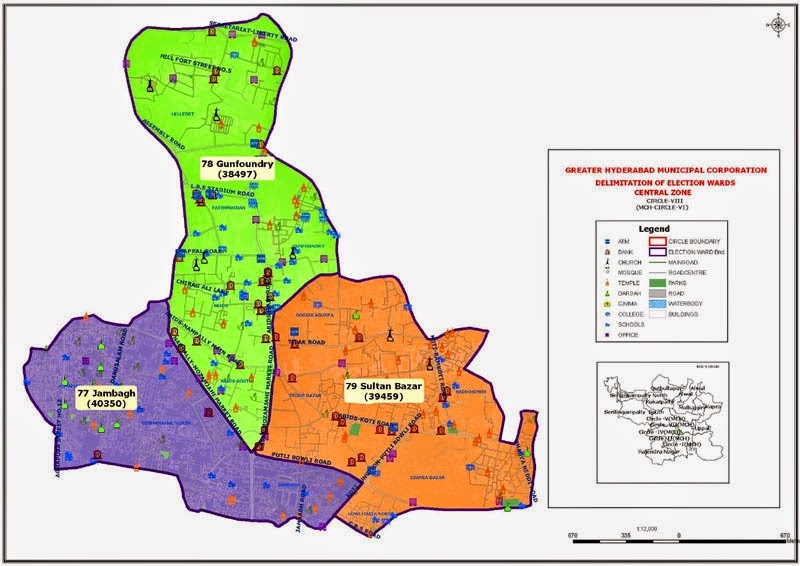 The wards are Defense Colony, Moulali, Safilguda, Old Malkajgiri and Gautham Nagar. Deputy Commissioner Office GHMC Malkajgiri, Nearby Ayappa Swamy Temple Gita Nagar 500047. You can see the Circle 17 Map below. 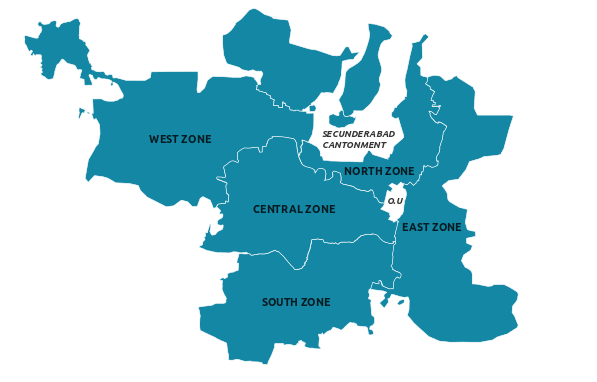 Circle 18: Secunderabad division comes under Circle 18 and it has 11 wards under it. 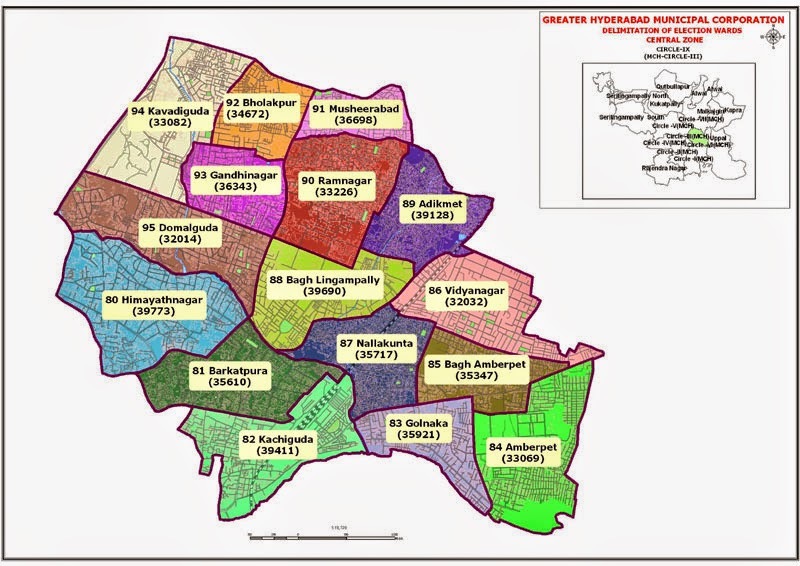 Some of the wards are Begumpet, Maredpally, Ramgopalpet, Tarnaka, Mettuguda and Chilkalguda. See the map for full list of wards. Deputy Commissioner, S.P Road, Sec'bad Division, General Branch, Sec'bad - 500003. You can see GHMC Circle 18 map below. Central Zone has 4 Circles under it which are 7,8,9 and 10. Circle 7: Circle 7 is Old Circle 4 in erstwhile MCH. It has 16 wards under it. 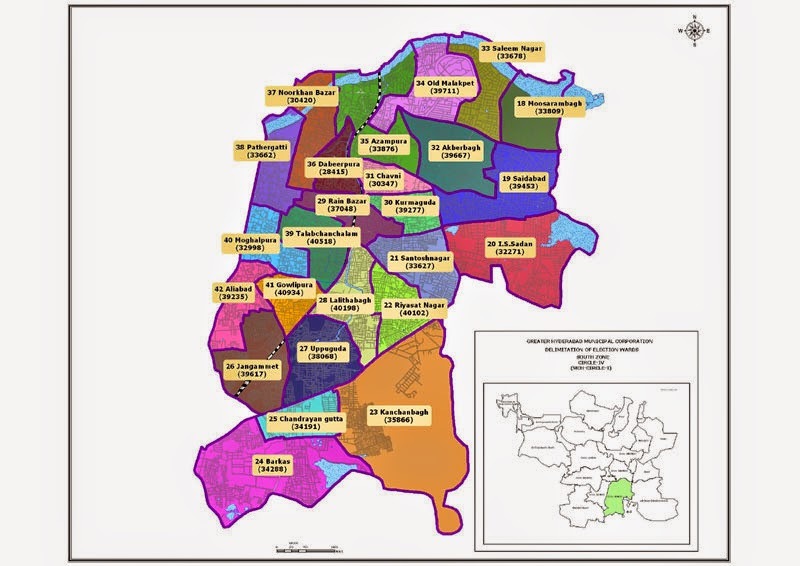 Some of the wards are Tolichowki, Langer House, Asifnagar, Red Hills and Mehdipatnam. Deputy Commissioner Circle No. 4, Khairatabad, Hyderabad. GHMC Circle 7 Map can be seen below. Circle 8 : Circle 8 is Old Circle 6 in erstwhile MCH. It has 3 wards under it which are Gunfoundry, Sultan Bazar and Jambagh. Deputy Commissioner Circle No. 6, MCH Parking Complex, 4th Floor, Abids, Hyderabad - 500001. GHMC Circle 8 Map can be seen below. Circle 9: Circle 9 is the Old Circle 3 in erstwhile MCH. It has 16 wards under it. 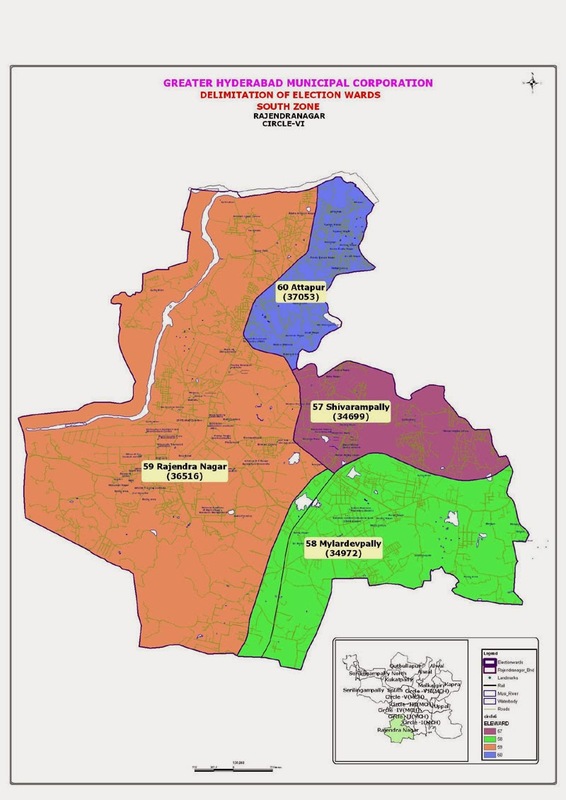 Some of the wards are Nallakunta, Domalguda, Himayatnagar, Kachiguda, Amberpet, Ramnagar and Musheerabad. Deputy Commissioner Circle No. 3, MCH Parking Complex, 6th Floor, Abids, Hyderabad - 500001. 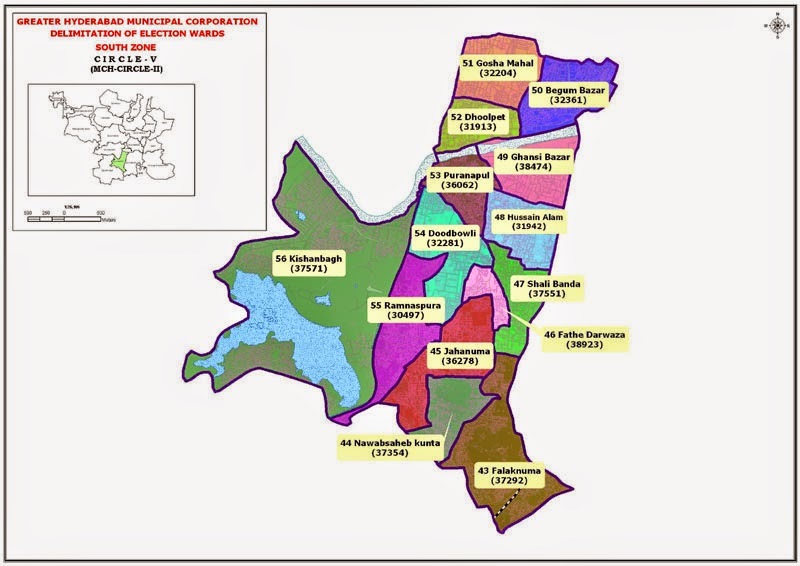 Full List of wards can be seen in the GHMC Circle 9 Map below. Circle 10: CIrcle 10 is the Old Circle 5 in erstwhile GHMC. It has 15 wards under it. 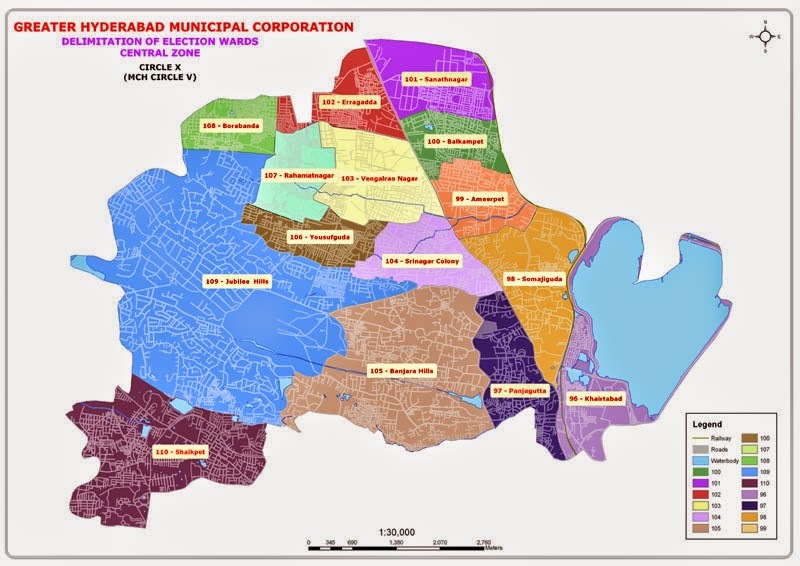 Some of the wards in Circle 10 are Somajiguda, Khairtabad, Srinagar Colony, Yousufguda, Banjara Hills, Jubilee Hills, Ameerpet, Sanathnagar and Shaikpet. Deputy Commissioner Circle No. 5, Khairatabad, Hyderabad. Full list of the Circle 10 can be seen in the map below. GHMC East Zone: It has 3 circles under it which are Circle 1,2 and 3. Circle 1: Kapra is Circle 1 in East Zone. It has 5 wards under it which are Kapra, Yapral, Cherlapalli, Mallapur and Nacharam. Deputy Commissioner Office GHMC Kapra, DAE Colony, Kamala Nagar, Kapra - 500062. Map of GHMC Circle 1 can be seen below. Circle 2: Uppal is Circle 2 in GHMC East Zone. It has 3 wards under it which are Uppal, Hasbsiguda and Ramanthapur. 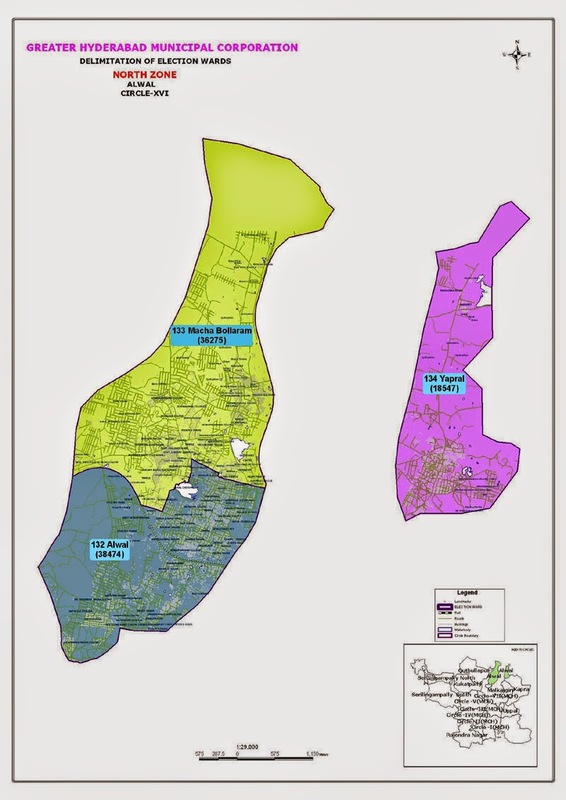 You can see GHMC Circle 2 Map below. Circle 3: LB Nagar & Gaddianarram are Circle 3 in GHMC East Zone. It has 13 wards under it. 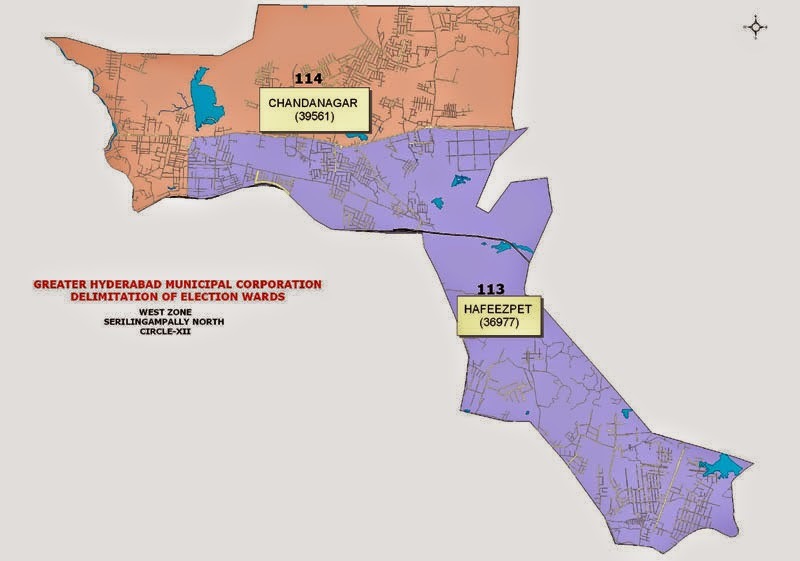 Some of the wards are Champapet, Kothapet, Saroornagar, Hayathnagar and Karmanghat. Circle 3 Office Address: It has 2 offices. 2. Deputy Commissioner (Gaddiannaram) , H No 23-30/1 Krishnaveni Nagar, Muncipal Office Building, R R Dist, Hyderabad - 500068. GHMC West Zone: It has 4 Circles under it which are 11,12,13 and 14. Circle 11: Serilingampally (South) is Circle 11 in GHMC West Zone and it has 2 wards under it which are Serilingampally and Gachibowli. 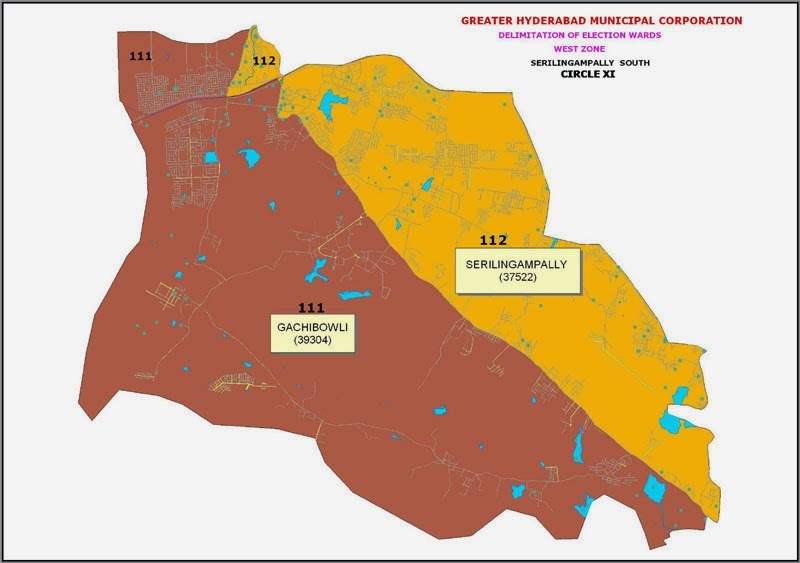 You can find the areas under GHMC Circle 11 in the map below. Circle 12: Serilingampally (North) is circle 12 in GHMC West Zone. It has 2 wards under it which are Chandanagar and Hafeezpet. Commissioner Municipal Office, Sy No 25 A, Serilingampally, Municipal Office, Nr E-Seva Center, R R Dt, Hyderabad - 500050. You can find the GHMC Circle 12 Map below. Circle 13: Ramachandrapuram & Patancheru is Circle 13 in GHMC West Zone. It has 3 wards under it which are Patancheruvu, Bandlaguda and RC Puram. Circle 13 Office Address: It has 2 offices. 1. Deputy Commissioner Office, GHMC Patancheru Circle, Near By Post Office Patancheru -502319. 2. Deputy Commissioner Office GHMC Ramchandrapuram, Near By ZP High School, Pin 500032. 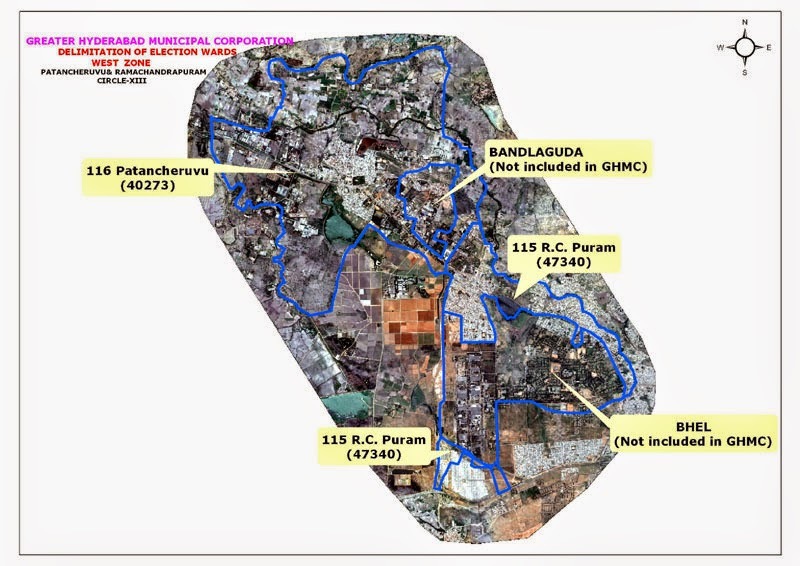 GHMC Circle 13 Map can be seen below. Circle 14: Kukatpally is Circle 14 in GHMC West Zone. 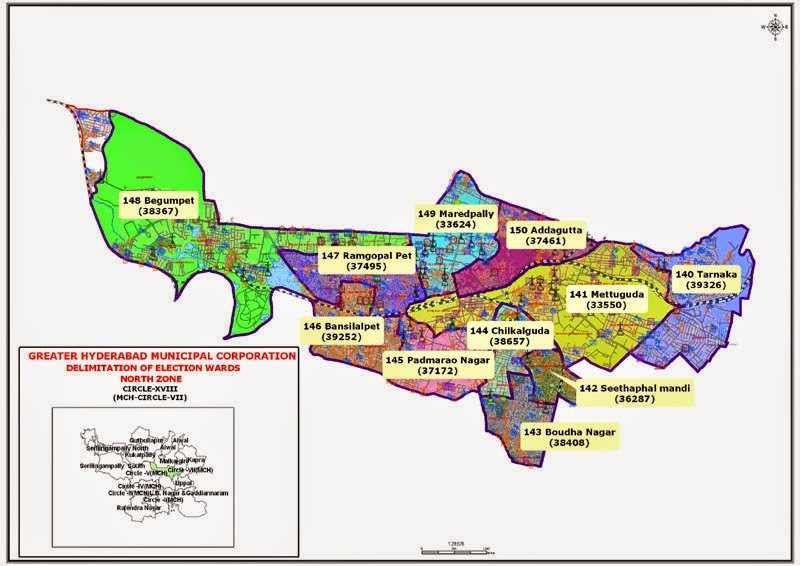 It has 8 wards under it which are Kukatpally, Old Bowenpally, Hydernagar, Vivekananda Nagar Colony, Moosapet, KPHB Colony, Motinagar and Fatehnagar. Deputy Commissioner Kukatpally, Janathanagar, Moosapet, Kukatpally Municipal Office, Hyderabad. GHMC Circle 14 map can be seen below.